Also called "blanking panels", filler panels are used to control the air flow inside of server racks. Without the use of filler panels, the hot exhaust air from the servers can be recirculated through the server and significantly reduce the cooling efficiency of the system. 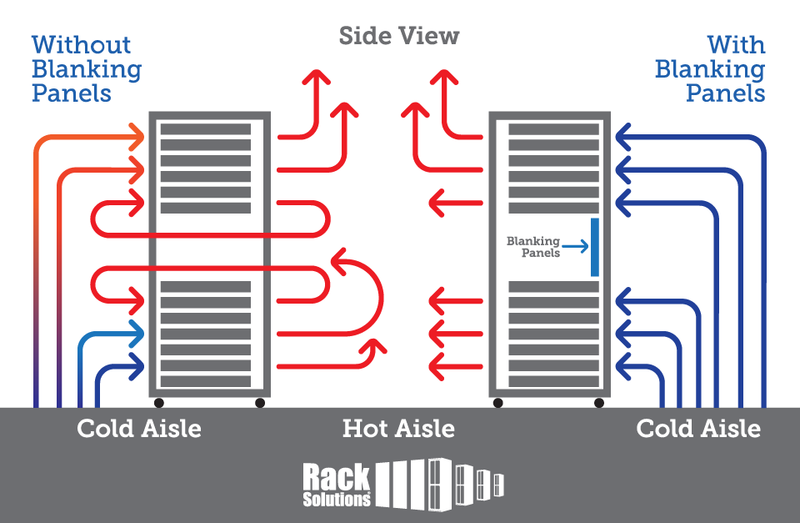 Along with the increase in airflow efficiency, RackSolutions filler panels give your rack a seamless and professional appearance while optimizing the power consumption of the data center. The tool-less model is great for quick installations and areas of the rack that may need easy access. The panel slips into the desired U space and secures with a turn to lock mechanism. Compatible with all EIA Standard 19" racks and cabinets with square holes. Without the use of blanking panels, hot exhaust air can be recirculated back into the cold aisle and reduce the cooling efficiency of the system. Above is a real world example of how can be used to occupy space that is not being filled by equipment.